Google employees have documented dozens of allegations of harassment at the company that have yet to be made public, an employee told Yahoo Finance at a company walkout in New York City on Thursday. The move follows a New York Times report that Google shielded Android creator Andy Rubin against a sexual misconduct claim, awarding him a $90 million severance package and a fond farewell on his way out. On Thursday, Google employees around the globe protested the company’s positive treatment of Rubin and other executives who were reportedly protected against harassment claims. The walkout follows a string of reports of misdeeds, hubris and harassment at some of Silicon Valley’s most high-profile companies. “We have a list of numerous examples so far that have been collected internally,” a female Google employee told Yahoo Finance, requesting anonymity to discuss the matter. “I know there are at least 30, and there’s definitely more than that. That speaks exactly to that point where complaints have been raised and the recommendations have been that, for instance, transfer to a different team and putting the response on the victim and not going after the actual person who is being accused of the harassment,” the Google employee stated. “There have been at least dozens of examples collected that I don’t believe have been represented in any of the communications that have been made public to date,” she added. Employees began streaming out of Google’s New York City headquarters at a little past 11 a.m. as part of the protest that had the backing of Google’s top brass. “I think many of us want to support our colleagues who feel like they’re not sufficiently respected or represented,” said Doug Rohde, an engineering manager at the tech giant. Three hours later, thousands of Google employees gathered at the company’s Mountain View headquarters to hear and support organizers, who rallied the crowd with chants like, “Hey hey, ho ho. Harassment has got to go.” Many employees expressed their disappointment, as well as their own allegations of sexual harassment. “My dream from when I was a very young person was to come work at Google in a community of academics, and technologists, and intellects, where I could bring my whole self to work, where I could be safe, where I could exceed, and I am fed up, because Google has not been that place,” Demma Rodriguez, head of equity engineering at Google, told the crowd in New York. One human resources employee in Mountain View read aloud the written statement of a Google employee who chose to remain anonymous and contended the company did not keep her complaint confidential. Another employee who spoke at the Mountain View protest said another member of her team grabbed her without her consent. When she shared the incident with her manager, she didn’t get the reaction she was expecting, she said. “My manager thought I was overreacting and said that I should get over it,” recalled the employee, who added that she continues to work alongside the employee who harassed her to this day. 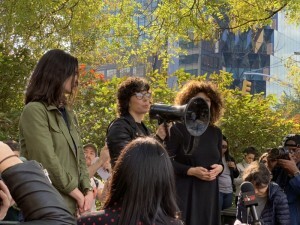 In New York, employees walked two blocks from the entrance of Google’s building on 8th Ave. to a rallying point at the 14th Street Park near 10th Ave. At that point, the leaders of the walkout, who wrote an op-ed in New York Magazine’s The Cut outlining their demands for Google, took center stage and discussed where they thought the company needed to change. Meanwhile in Mountain View, thousands gathered at the heart of Google’s headquarters for 45 minutes, before walking several blocks down Charleston Road, signs in hand. Tanuja Gupta, one of the Google employees who authored the op-ed for The Cut, said she was leading the protest for other employees. “I’ve been at Google for 7 years. I have both a sexual harassment and sexual discrimination case, and I was forced to use arbitration,” Gupta said. In their op-ed, the Google employees laid out their demands for the company including an end to forced arbitration; a publicly disclosed sexual harassment transparency report; a clear, uniform, globally inclusive process for reporting sexual misconduct and for the company’s chief diversity officer to answer directly to Google CEO Sundar Pichai. Following the New York Times piece detailing Google’s treatment of Rubin, Pichai released a statement asserting the company had been working to stop sexual harassment and that it had already fired 48 people for offenses. For now Google employees say they have additional events planned including a walkout in its Asia Middle East Africa region next week, and internal groups seeking to address harassment.